MIDDLEBURY, Vt. – A recent Middlebury graduate says the College should transform the Robert Frost cabin in Ripton into a resource for writers and students, and her idea is starting to gain traction. Rebecca Hartje ’14, of Chattanooga, Tenn., calls the cabin "a forgotten treasure" that's been overlooked ever since Middlebury College acquired the Homer Noble Farm in 1966. The poet had spent a portion of nearly every summer from 1939 to 1962 at the rustic cabin located on a 150-acre tract west of the College’s Bread Loaf Mountain campus. Hartje (pronounced “Hart-gee”) is the first graduate of the Middlebury’s museum studies track, a new area of specialization within the history of art and architecture major, and her senior thesis makes an impressive case for revitalizing the cabin as a place where scholars and writers could go to appreciate Frost’s life, his work, and his craft. The alumna recommends presenting the cabin as a writer’s home – a distinct offshoot of historic house museums, she says – partly because it’s unrealistic to think that most or all of Robert Frost’s original items could be returned to their respective places inside the pine-paneled structure. The isolation of the site, the harsh winter weather, concerns about security, and the simple fact that many of Frost’s belongings – most notably his books – are not in Middlebury College’s possession have led Hartje to advocate for the cabin’s revitalization as “an inspirational setting for learning and reflection” versus a museum for casual and serious visitors alike. Rebecca Hartje '14 was the Robert Reiff intern at the Museum of Art. Instead of having the cabin open to the public on a regular basis, Hartje proposes the space be reserved for poetry classes, field trips, and special programming. Frost’s iconic Morris chair from the cabin, which is on permanent display in Special Collections at Middlebury’s Davis Family Library, is too valuable to relocate in the cabin, yet Hartje says a replica of the chair could be installed in its original place inside the cabin to give visitors the same sensory experience as the Pulitzer Prize-winning poet. In his cabin Frost kept works by Byron, Emerson, Dickens, Thurber, Pound, Whitman, Baudelaire, Tennyson, Shakespeare, Keats, Cather, and Auden. He also had 20th-century novels, reference works, classical writings, histories, and biographies. 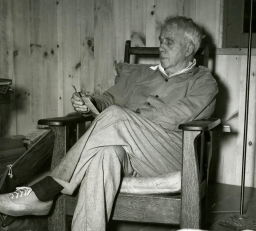 Dozens of books are inscribed to Robert Frost, many contain Frost’s own “winding road” bookplate, and several copies contain notes scribbled in pencil by the author himself. Many of Hartje’s ideas developed over the course of the year she spent researching and writing her thesis with guidance from advisors Jay Parini, Axinn professor of English, and Richard Saunders, director of the Middlebury Museum of Art and professor of history of art and architecture. The summer before her senior year Hartje received an academic outreach grant from the College to visit writer’s homes and museums. She traveled to Frost Farm in Derry, N.H., Frost Place in Franconia, N.H., and Frost Stone House Museum in South Shaftsbury, Vt., and also visited Emily Dickinson Museum in Amherst, Mass., Margaret Mitchell House in Atlanta, Carl Sandburg Home in Flat Rock, N.C., and the site of Henry David Thoreau’s cabin on Walden Pond in Massachusetts. Frost in 1961 on the steps of his cabin. Film footage of Frost walking at Bread Loaf has been digitized by Special Collections and could also be put to use in an exhibit at the cabin. Hartje proposes the College form an oversight committee to consider a thoughtful redesign of the interior, the development of cabin-related programming, and a plan for the future. Pieter Broucke, professor of history of art and architecture, has agreed to create the committee with representatives from Bread Loaf School of English, Facilities Services, Committee on Art in Public Places, and academic departments. He says Hartje "did an incredibly thorough job" and "got us going on a truly exciting project." Written by Robert Keren with archival images courtesy of Special Collections and a photo by the author. I think that the Frost cabin is a treasure as it currently exists. His Derry Farm, Franconia Farm and South Shaftsbury home provide locations for those interested in a museum, but I would prefer that the cabin remain untouched. Something should be left for those willing to dig deeply on their own. I like Rebecca's suggestion, as I too like poetry. My concern is that I don't want to see the cabin destroyed, so giving it somewhat of a restoration could be beneficial. Holding poetry classes their with Robert Frost speaking the words from his own poems sounds interesting. I would like to visit it when it opens. I applaud Rebecca Hartje's constructive idea of making the Frost cabin an active tribute to Vermont's iconic poet rather than an empty "undervalued piece of history". Along with the poetry classes, field trips and special programming that Hartje suggests, I would think that it would be possible to schedule certain times for public visits.